Not like the old days – the dawning of a new era: The 1970s; From cards to computers: The 1980s; A decade of optimism: 1990–2000; Harvest time: 2000–2007; The challenges for libraries in the future. Scientific libraries have undergone dramatic changes since the end of the 1960s. This book explains and characterises these changes and main trends, and describes their consequences for libraries. The book presents an overview and an analysis of long-term developments in the field. Professionals within library and information sciences, together with students, will find the book of interest, enabling them to understand the situation of the libraries today and also prepare them for decisions about the future. Dr. Tomas Lidman is currently leading a National Committee on Literature at the Ministry of Culture in Sweden. Until 2010 he was a national archivist in Sweden, and prior to this he was University Librarian in Stockholm. Dr. Lidman has overseen a variety of endeavours including project-leader in EU, IFLA, UNESCO, and Vice President of ICA (2005-2009). Since 2003 he has held the Presidency of the Royal Institute of Fine Arts in Stockholm and between 1995 and 2003 he was a national librarian. He took his PhD in History in 1979 and has written several books in History, Librarianship and Library history. 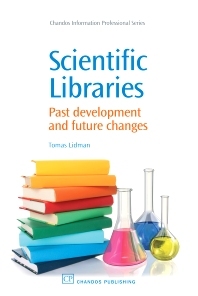 In 2008 he wrote Scientific Libraries: Past development and future changes, for Chandos.